My 20-year-old cousin has been taking classes at her local community college for two years, and she's still nowhere near the required units she needs to transfer to a four-year university to pursue her degree in psychology. Why? The classes she needs are filled to capacity. My advice to her was to start looking into online courses for credit. Universities are finding ways to get their curriculum to students that don't require their physical presence at the schools. 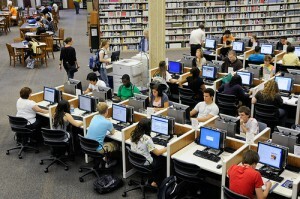 Before instating its online teaching program in 2009, the MAT program at USC graduated about 100 students every year. By contrast, it currently has more than 1,500 students enrolled in the online program. The article also lists other ways virtual schools are changing the education landscape, i.e., by making valuable education free for everyone and anyone. Innovative Educator Lisa Nielsen adds her unique perspective to the subject, with her article : "10 Reasons Students Say They Prefer Learning Online." "I can take more interesting classes."